Martin Luther King Day weekend was excellent for live hockey consumption for me. Not only did I get to see my Red Wings in action against the Rangers at MSG, I also went south to catch the annual Iron Cup match up between University of Alabama’s Frozen Tide and Auburn University. The Detroit Red Wings that showed up Thursday, January 16 at Madison Square Garden looked good. Even though some marquee names were missing, the guys that showed up were ready to play. The stars of the night were definitely the goalies. Jimmy Howard and Henrik Lundqvist were outstanding. Time and again these two turned away shot after shot. While I’m not a fan of the Rangers, both teams looked great and it was a fun, spirited game to be in attendance for. As the third period opened, it was clear this would be a one goal game. Unfortunately, the outcome was against the Red Wings as Rangers Mats Zuccarello got by Howard with under six minutes to go in regulation. What made this even worse was that Zuccarello was attempting a pass, not a shot on net, and the puck deflected off Detroit D-man Brian Lashoff to scoot by Howard. If the game had to go to the Rangers I suppose this way was a blessing. During second intermission I feared the teams were going to not score during game play and we’d end up in a shoot out. With SO proving dismal this year for the Wings, at least I didn’t have to sit through that pain (and perhaps this SO issue is turning around since the Wings have won their last two, against L.A. and Chicago). January has not been good for the Wings, racking up four losses, two regulation wins and one shoot out win (that’s as of the January 20 St. Louis game). The most brutal of those losses was likely the Winter Classic on their home turf. At least the Classic made for some good TV (although as Eric pointed out, it wasn’t always so great for those in person). The other losses were either shutouts or by three goals — and neither of those is a good way to go. 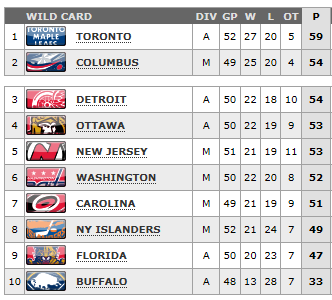 Currently (as of Wednesday night’s Blackhawks game) the Wings are out of playoffs, sitting one place out of a wild card position. Will this be the first season in more than two decades they don’t make the post season? I’m not feeling confident with the team’s inability to be consistent. I know it’s been hard with so many injuries, but the guys need to to find what it takes to close more games. The contests that are left before the Olympic Break—Montreal, two with Florida, New Jersey, two against Washington, Vancouver and Tampa Bay—look to be more of the same where they will squeak out a win and then lose the next game. Eighteen points are on the line. Nothing would be better than to take them all (or at least the majority of those points). However, with the current state of play my prediction is they’ll be lucky to pick up half. Back to my hockey weekend… After Thursday night at MSG, I was on a Birmingham-bound plane Friday morning to catch the Iron Cup games. The score across the three games tells the very lopsided story. University of Alabama’s Frozen Tide pummeled (and then some) Auburn with a 25-2 total score. For the UA football diehards, that probably doesn’t completely make up for November’s disastrous Iron Bowl, but it had to help. Over the best-of-three competition the score broke down to 9-1, 3-0 and 13-1. 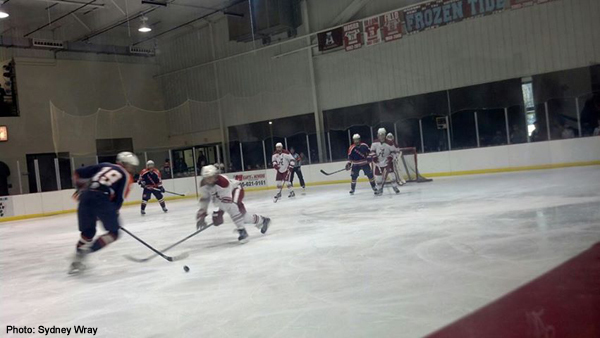 The Tide schooled Auburn in puck movement throughout the weekend. It was beautiful watching the team routinely setup shot after shot on the War Eagle goalie. The Frozen Tide has done a great job bringing in new talent this year after several players graduated at the end of last season. They are currently 13-9 for the season with four critical SECHC games left in the season. As I’m writing, this week’s SECHC standings aren’t out yet (before the Auburn games, they were 1-3 in SECHC play). The Tide was hopeful to move up a position coming off the Auburn wins. These final four games need to be won as the team wants to secure one of the top two SECHC slots so they’ll lockup a trip to the ACHA Division 3 finals, which play March 11-15 at Florida Atlantic University. Even if they don’t lock up the trip, there’s still regional playoffs where they can earn their trip… but it would be far better (and cooler) to get it during regular season play. After watching the games the Tide put on the ice this weekend, I’m confident they’ll do it. They play with a confidence and skill that should get them the trip to nationals they’re on the hunt for. I wish I could get down there to watch the final four games, but I’ll be satisfied following on Twitter. Roll Frozen Tide Roll! Jeff covers the Red Wings and reviews fiction that features gay hockey players for PuckBuddys. In addition, he’s written a young adult novel, Hat Trick, which details the coming out of two high school hockey players. He’s currently working on two sequels to that book. You can follow him on Twitter at @hockeyguynyc. This entry was posted in Detroit Red Wings and tagged Bama: The Frozen Tide, Brian Lashoff, Detroit Red Wings, Henrik Lundqvist, Jimmy Howard, Mats Zuccarello, University of Alabama. Bookmark the permalink.